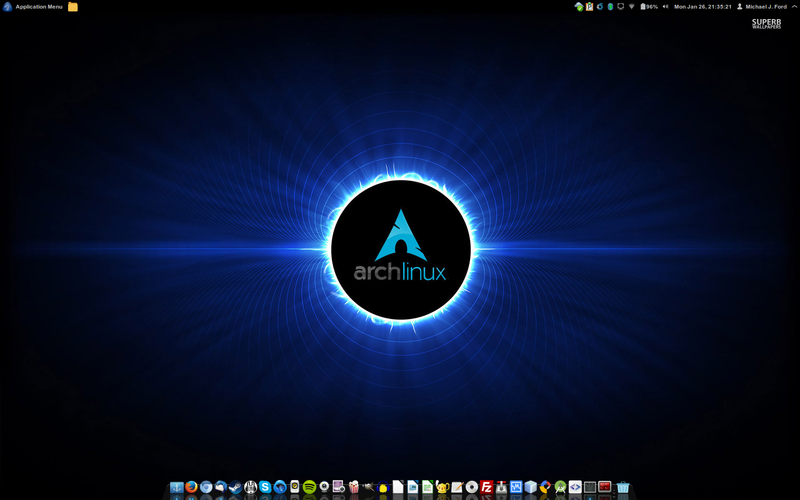 My distro hopping bone was itchy last week, so I started to play with Arch by the way of Antergos over a weekend on a test machine. And it went well, I have since "nuked and paved" my laptop from Ubuntu 12.04.5 to Antergos (Arch) 2015.01.01. Currently running the latest Linux kernel, 3.18.2-2, and Cinnamon 2.4.6 as my desktop environment and its is wicked awesome. I came for the rolling release structure, I stayed for pacman. Pacman is the biggest reason I am starting to make the switch to Arch. Any software package I can think of is either in the official repos or in the AUR (which is available as a simple on tick in the installer), pacman -S [pkgname] or yaourt -S [pkgname] to install software. No more dealing with ppa's that may or may not be updated/broken/disappear [I'm looking at you russo]. Just software when I need it and always up to date. A choice of desktop managers upon installation, in fact it is one of the first choices. I chose Cinnamon my self, but others include: Gnome 3, KDE, MATE, LXDE, OpenBox, and I think Window Maker. Simple, you are given a choice from the start instead of installing say Ubuntu with Unity then want to use MATE later on; then trying to remove all Unity packages later on. Nope not dealing with that any more. Now I can just install MATE, all it's dependency's, then remove Cinnamon and it's dependants. Arch/Antergos is probably one of the best distros I have used on the desktop and I'm only a day in. I was able to get my install set up and usable faster than any Debain Desktop I have ever used. However still using Ubuntu/Debian for all of my servers. Slow updates are sometimes good. They do a bit more testing before a patch/upgrade is released. Arch is not for the faint of heart. It's a CLI centric distro, everything is configerable from the command line. However what is nice is the settings panel in Cinnamon exposes more than any other desktop I've used in the past. But if you've been using Linux on the desktop for awhile and are itching for something new, Arch/Antergos may be just what you've been looking for.